Veer Lofts (www.veerlofts.com), Vulcan’s first South Lake Union condominium/loft project to complete (technically the 2200 is not in SLU) received its temporary certificate of occupancy recently, and first move-in is expected shortly. With Veer, Vulcan seeks to emulate a trendy industrial loft feel with open spaces accented with heavy timber beams, concrete and metal. 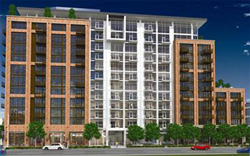 The six-story building contains 99 homes with three distinct home plans – flats, lofts with a flexible space and two-level full lofts. Prior to the TCO, our only glimpse of Veer was through the rather limited kitchen vignette at the SLU Discovery Center. And, honestly that single vignette provided an underwhelming impression of Veer, especially when compared to Vulcan’s other under-construction projects – Enso & Rollin Street. I had the opportunity to tour Veer this week and I must say that it exceeded my expectations; partly because the finish materials are higher quality than originally sampled. And, also because the interior layouts exhibit an efficient use of space. Though, there were a couple of odd quirks. The in-unit exposed sprinkler pipes were not symmetrically installed. There may be a building code reason for this, but visually it was distracting. And, in the common stairwells, the sprinkler pipes hang below the ceiling decreasing overhead clearance, which is only an issue if you’re hauling large items up and down the stairs. At least in two flexi-lofts units I toured, the access point to the loft area was hindered by the ceiling beams that effectively decreased the height of the opening. I’d be hard press to visualize the flexi-loft space as anything other than storage. But, that’s fine. There’s more than ample living space on the main level. Inside, the light colored concrete floors on the main level and over-sized windows provided more than ample ambient light. In the flats, a 3/4 height kitchen wall allows light to pass through to the sleeping alcove. The top-level full-loft homes are impressive with its soaring 16′ ceiling height, multiple decks and territorial city views. Curiously though, to access the private outdoor space (top-floor units) you’ll need to step out through a window opening, which is smaller than shown in renderings. 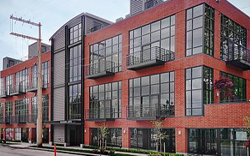 Veer Lofts has a number of units available offering an excellent array of home options, primarily flexi and full-lofts. There is only one flat still available, unit #207 that’s being offered at $404,950. 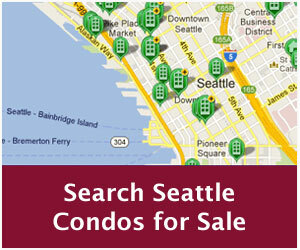 This is a 751 square foot unit with windows on three sides offering views of downtown and Lake Union. The flexi-lofts, located on the 4th and 5th floors, range in size from approximately 600 to 740 square feet and are being offered between the upper-$300,000s and upper-$400,000s. One note about the flexi’s, the stated square footage does not include the loft space, which would add an additional 250 to 350 square feet. The full-lofts, located on the 1st and 6th (top) floor, range in size from approximately 807 to 1,073 square feet. 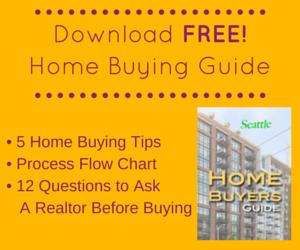 The 1st floor homes start from the upper-$400,000s while the top floor homes begin in the mid-$500,000s. An on-site sales office and staged model homes will open to the public beginning Thursday, October 9th. The sales office hours are 11:00 AM to 6:00 PM. View available Veer Loft units for sale. Three other recently completed new construction developments provide homes with similar layouts to Veer. These include Madison Lofts, Gallery and Mosler Lofts. Here’s my impression on how they compare to Veer. Madison Lofts is a much smaller building with only 20 loft homes compared to the much larger 99-unit Veer. All of Madison Lofts’ homes are multi-level full-lofts with 16′ ceiling height, on-par with Veer’s full-lofts. Homes at Madison Lofts essentially start from the upper-$400,000s, though two larger units with expansive outdoor space begin at just under $1 million. With a few exceptions, the interior layout and square footage between the two projects are quite similar. But, Madison Lofts scores more points for better construction (concrete/steel vs. wood frame), a more polished interior with better quality finishes and more usable, larger exterior spaces. Veer gains points for its central location, in the middle of the yet to be fully realized SLU district and close to downtown. Madison Lofts, on the other hand, is tucked way next to the arboretum, a good 15-20 minutes from downtown. The Gallery condominium in Belltown is in the final stages of completion with residents already moving-in. At one point Gallery offered “SkyLofts”, two-level loft units on the upper floors, but eventually replaced those with single-level flats. Fortunately, for those interested in loft living, Gallery did retain its ground floor loft-styled townhomes. Though, these are aimed towards a different demographic and are larger, ranging in size from 1,000 to 1,195 square feet. They’re also priced quite a bit higher, between $622,000 and $740,300. Gallery is a concrete and steel building located within the established Belltown neighborhood, so it has an edge over Veer in that respect. With its refined interiors, it lacks the urban industrial character of Veer and Mosler. Gallery offers a greater variety of home options which will appeal to a more diverse homeowner base as well. The concrete and steel constructed Mosler Lofts, also located in Belltown, offers similar ground floor loft-style townhome units. Mosler has a more industrial aesthetic compared to Veer, with exposed concrete walls and ceilings and exposed HVAC ducts, but does have higher quality finishes and more common amenities. Presently, only one of the five loft-townhomes is available. 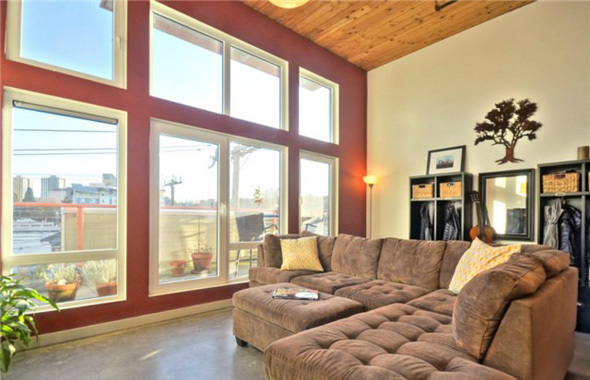 It’s a 962 square foot home offered at $579,000, which competes directly with Veer’s top-floor lofts. Although, Mosler has a superior build quality, more amenities and located in an established area, on price, a top-level Veer unit is a compelling option. Veer’s top-floor lofts offer city or lake views, private decks and a greater sense of security. 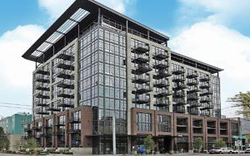 Veer Lofts is located in Seattle’s most aggressive urban renewal and reinvention projects, South Lake Union. 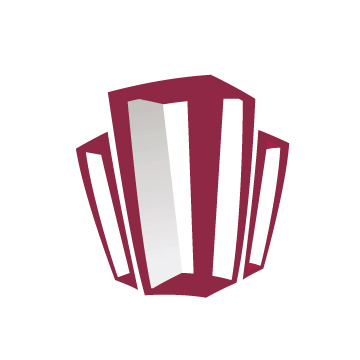 Led by Paul Allen’s vision, SLU is actually an amalgamation of numerous entities that represent diverse interests – educational and research institutions, market-rate and low-income residential development as well as commercial/office developments. Local companies setting-up shop in SLU include Group Health, UW Medicine, Rosetta, Tommy Bahama, Amazon, Microsoft, Weber Thompson and NBBJ. Additionally, Microsoft is expected to be the principal tenant of the 2201 Westlake office building (Enso). Of these three developments, did either Veer or Mosler lofts include attractive and functional window coverings with the units? Rumor has it Madison lofts put automated solar screen shades in their units – at least more attractive than mini blinds. Screen shades provide some glare control and UV protection (but not privacy). Average cost for loft or condo window treatments can easily add $10K to $15K to the total price tag of your loft or condo living; upwards of $20K if automation is desired. It’s something to think about when considering the total home price. Most condo buyers don’t even think about it until their furniture and art starts fading, they’re sweating and wearing sunglasses indoors from June to October, and they begin to tire of living on a stage unable to watch tv before dark. There is no window coverage included at Veer loft. Vulcan had a suggested provider, but the cost was not included in the asking price. At Mosler Lofts, window coverings were included. The were an almost black Hunter Douglas mini blind. The do a fine job of blocking sunshine and creating privacy and the best part is they were included in the price of the home. A bit of advice from someone who is still working through a year old punchlist on a new construction building. Do not close until the work is done to your satisfaction. In this market you hold all the cards, hold the developer to a standard of quality that you expected when you agreed to pay $600 per foot for a home. Once you close you will find they no longer have an interest in your issues and you will begin an uphill battle to simply have your expectations met. Just one caveat to what Menace11 mentioned…review your options with your agent or a real estate attorney. By not closing, assuming you haven’t mutually agreed to extend the closing date, you may be in breach of contract and could loose your earnest money.